New Hampshire is a state well known for its impressive stretches of wilderness, filled with incredible natural beauty and fascinating wildlife. 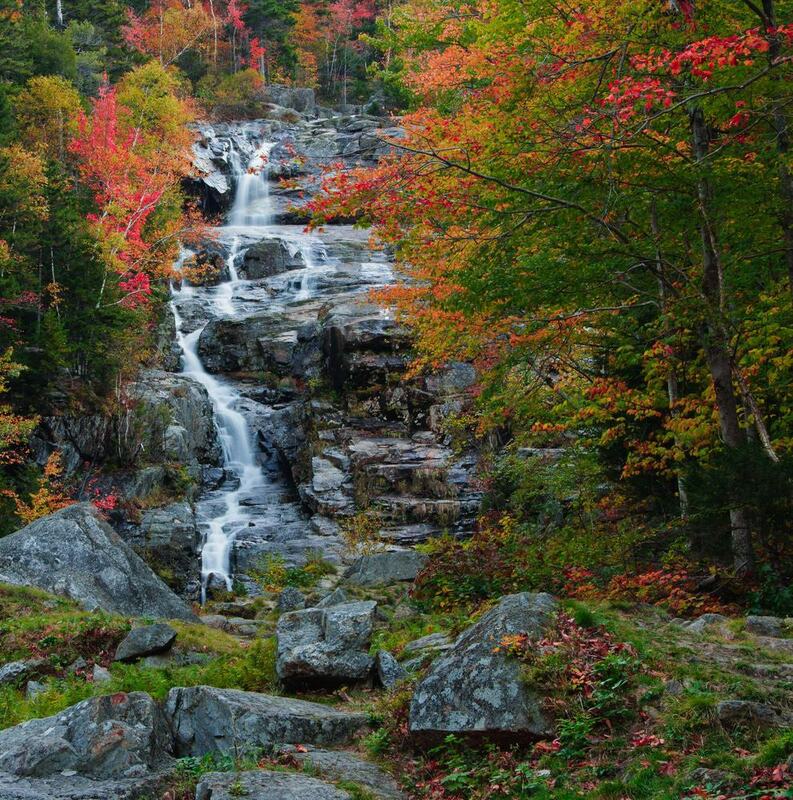 White Mountain National Forest in the north, with the towering Mount Washington, draws people to visit for winter adventures, and the natural beauty offers a wide array of stunning waterfalls for those willing to seek them out any time of year. 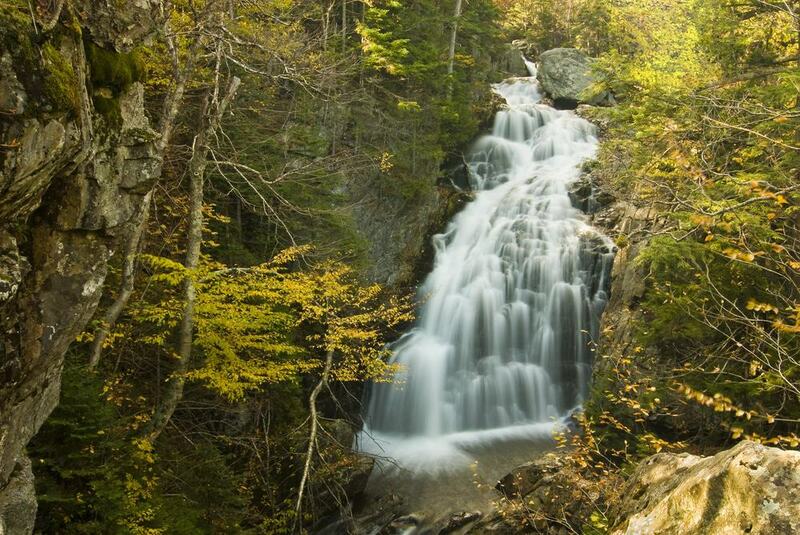 From towering cascades hidden deep in the forest to short hikes near the road that are enjoyable for the whole family, check out 15 amazing waterfalls in New Hampshire. 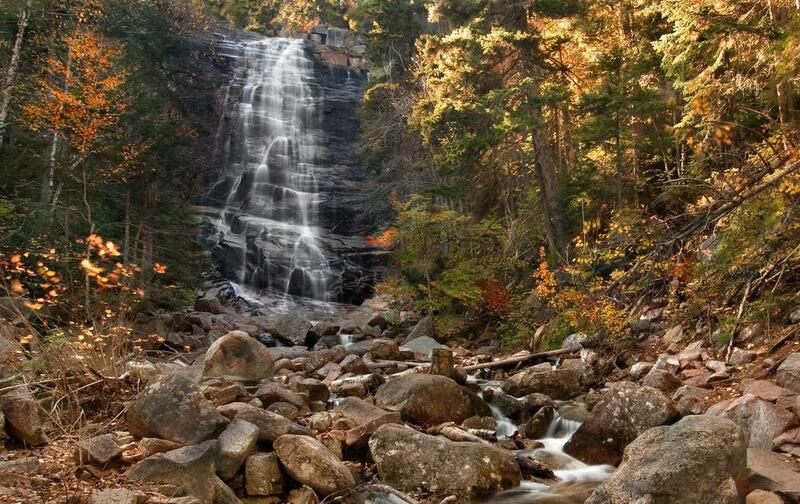 At 160 feet high, Arethusa Falls are New England’s tallest single cascade. During the winter months, the water is extremely powerful, but in summer, the falls are equally attractive – with dozens of rivulets and trickles creating a stunning scene. 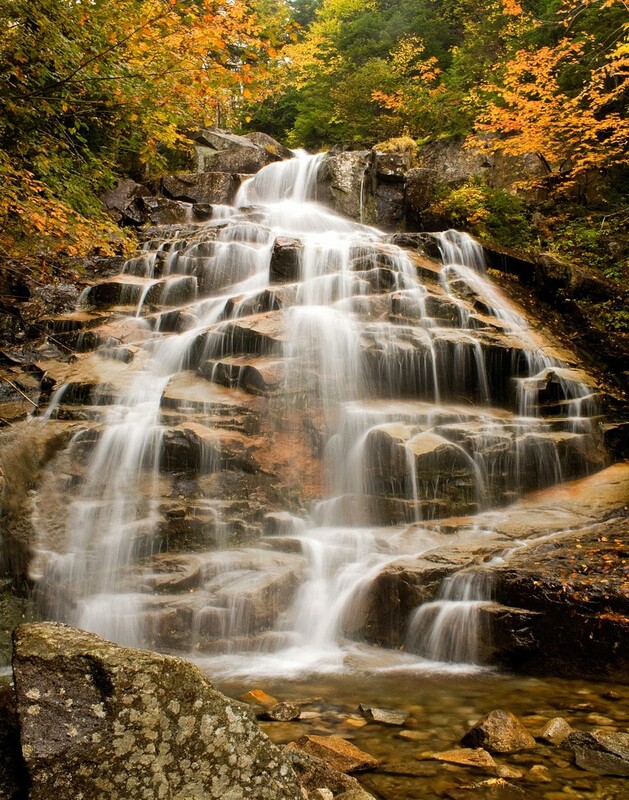 Located within the Crawford Notch State Park – part of the White Mountain National Forest – this horsetail waterfall is supplied by Bemis Brook and is simply spectacular. The trail to reach the falls is short at only 1.5 miles each way, but because it can be quite steep, it is rated as a moderate hike. It’s not possible to swim here, although there are two other waterfalls in the area that have nice pools to cool off in during the summer months. 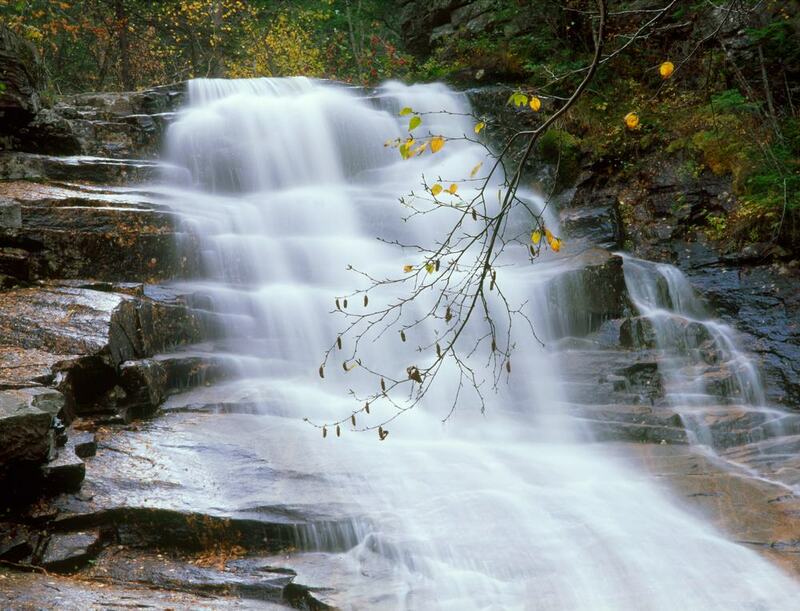 Also found in the White Mountain National Forest, the cascades are divided into an upper and lower fall, with a total height of around 300 feet, making them one of the tallest in New England. The trail to the lower falls is 2.4 miles and is moderately difficult. 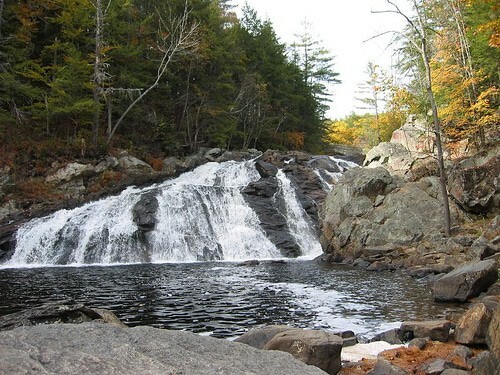 Although the hike has some steep areas and will take around two hours each way, you will be rewarded with a nice pool to swim in at the base of the lower falls. This waterfall comes with a unique history; it is named after a serving woman named Nancy, who entered the area one cold winter searching for her lost fiancé. She never found the man and succumbed to hypothermia in the chilly river. The easy out and back trail that leads to it is 0.6 miles long and is usually pretty busy with people heading to see these gorgeous falls. Sabbady Falls present a scenic series of cascades that form an incredible crystal-clear pool at the middle, before cascading down to the base. Unfortunately, swimming is not allowed here, in spite of the temptation of the gorgeous pool! The handicap-accessible trail has wooden steps that get you to the bottom of the falls. Lying on the Ellis River, Glen Ellis Falls is a natural spectacle. Part of the draw that makes them such a popular tourist attraction is the short and easy trail to reach the falls; it’s only a 10-minute walk along a well-maintained 0.3-mile trail. You can even bring your dog along for a pleasant nature walk, as long as it remains on a leash. There is a fee for parking, and it pays to visit early in the morning or during the week to avoid the crowds in this popular spot. Although this waterfall plunges attractively into an emerald green pool, swimming is prohibited, and there are warnings about the power of the river, so take care when exploring. 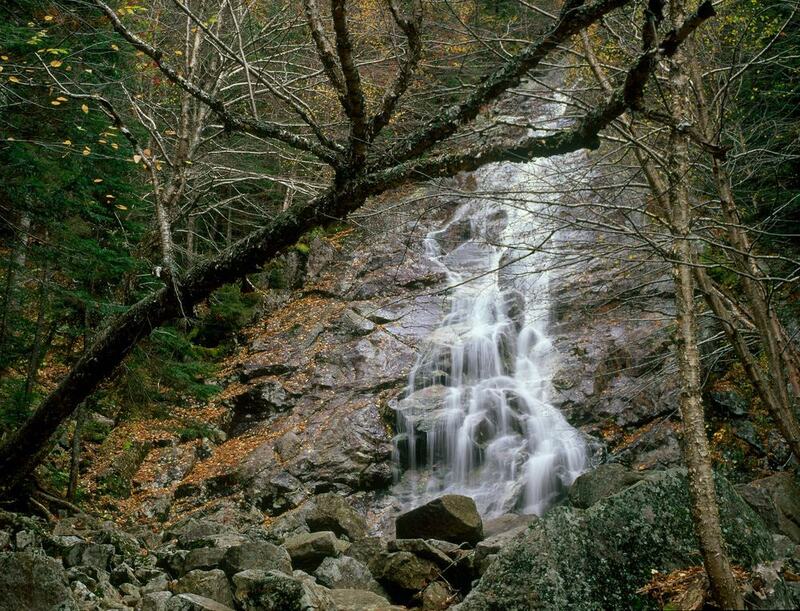 Sitting at the far east of Crawford Notch State Park is the tall Silver Cascade waterfall, estimated to be 1000 feet long and falling in a series of cascades over walls and ledges. Pouring down the side of Mount Jackson, the falls join the Saco River near the highway. If you’re not in the mood for a trek, part of this waterfall can be viewed from the roadside and parking area. If you want to see a little more, you can clamber over the rocks to reach the lower parts of the cascade. 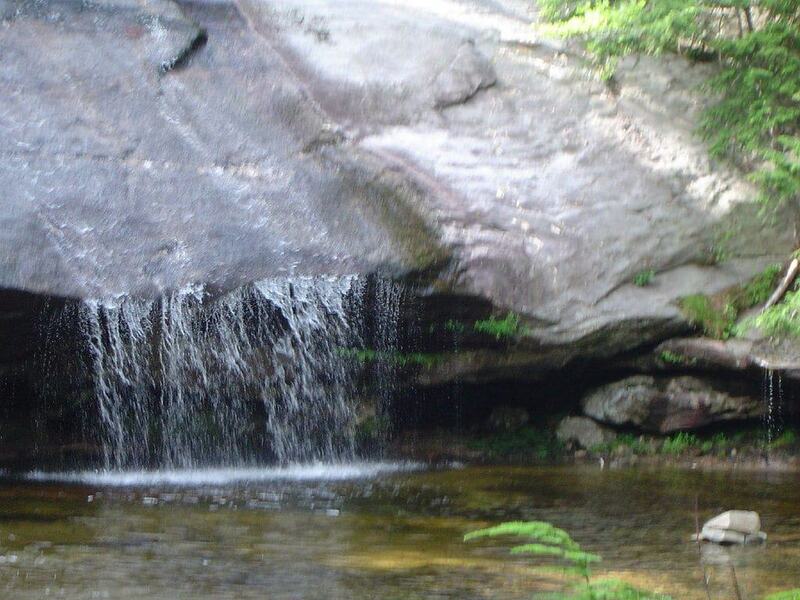 Water gushes down 100 feet in two segments with a shallow pool at the middle in this beautiful forest environment. Sourced by the Ellis River, Crystal Cascade is reached via an easy trail that is only 0.3 miles each way. Although the area is popular with hikers ascending Mount Washington, not many take the time to veer off and check out these falls. This is great news for those who do make the effort, as you’ll more than likely get the place to yourself. Take the Lion’s Head Trail or the Tuckerman Ravine Trail to get back to your car. Since this place can be treacherous, be sure to check Mount Washington’s weather forecast as a precautionary measure. The 0.6-mile trail that leads to Ripley Falls is full of rocks and roots. It is also narrow, so be sure to brace yourself for a rough yet short hike. The good thing is, the fall that drops up to 100 feet is worth sweating for. As you get close to the falls, you will be greeted by the sounds of gushing water running down the slippery rocks. For almost the whole of the hike, you get to hear the soothing sound of the cascade as it pours down the Kendron Flume. For more adventurous spirits, you can abseil down the face of the waterfall with local tour guides. 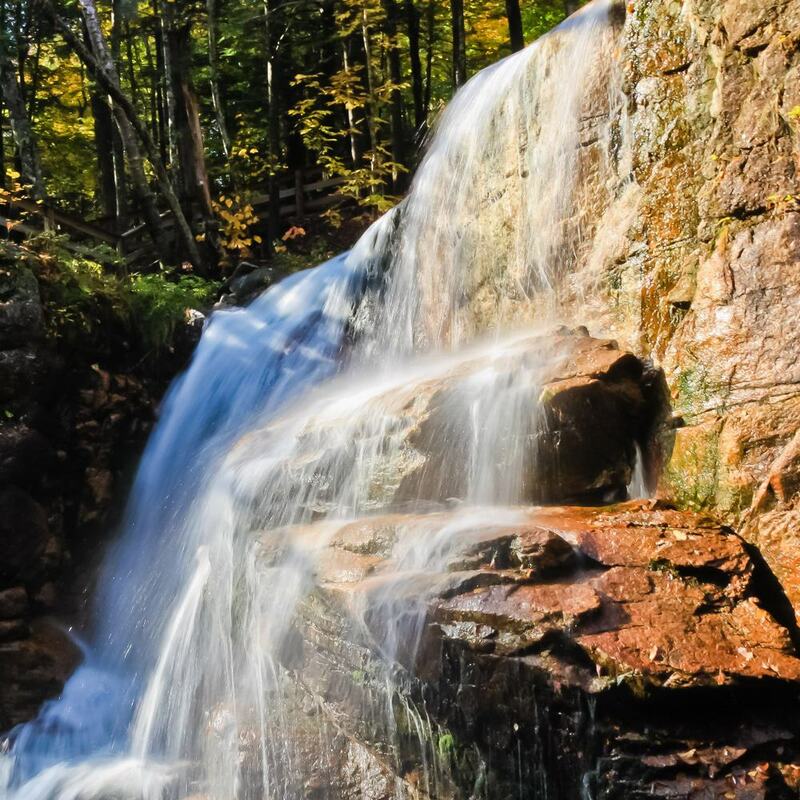 The 1.5-mile hike within the Franconia Notch State Park brings you to a series of plunges, horsetails, and cascades whimsically known as Cloudland Falls. 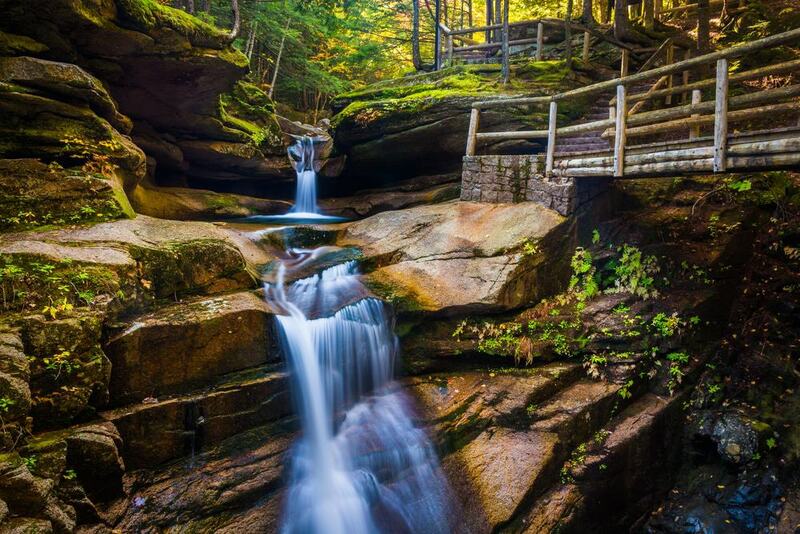 Situated in a cool yet dense forest, the water drops an impressive 80 feet. 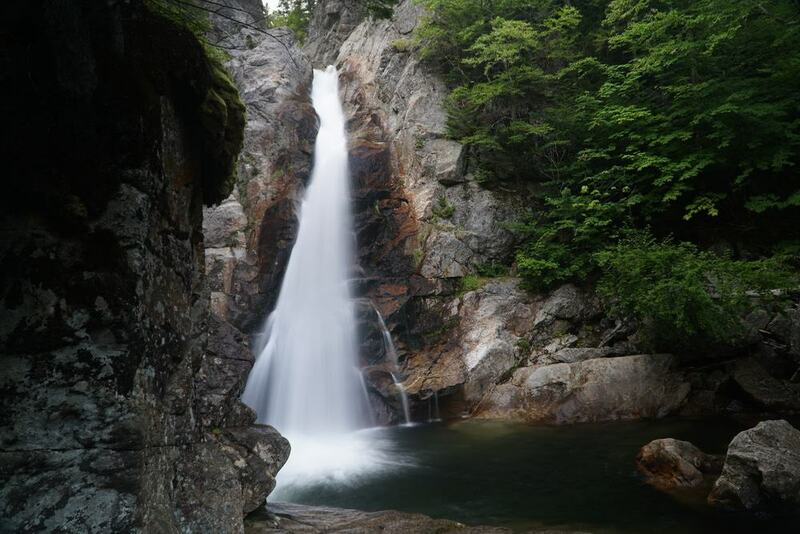 Take the Falling Waters Trail to reach the top of Little Haystack Mountain, checking out three waterfalls along the way – including this one, which is the last and biggest on the trail. Sitting at the southeastern edge of Bartlett is Diana’s Baths, a waterfall that presents a series of small cascades. Boasting a total drop of 80 feet – with the highest single plunge being 12 feet – the fall is adorned with smooth rocks that have over the years been sculpted by the falling water. Summer is always a good time for kids and adults to enjoy the tranquility of this pristine natural spot as they explore the pools, plunging cascades, and the many rocks and ledges. The 0.6 mile (one-way) trail that leads to the falls is well maintained and the hike will suit all fitness levels. Although it is easy to access the falls while wearing sandals, it is still advisable to carry a pair of hiking shoes. Within the confines of the scenic Shawnee National Forest sits the 100-foot Jackson Falls. All around are bluffs and rocks. You can see the upper falls from the roadside and it’s just a stone’s throw (0.1 mile) walk to reach the lower falls. Camping here is allowed, but only for a maximum of 14 days. Since it is close to the road, there is no need for hiking; for this reason, it is usually packed with visitors. This is the perfect picnic spot and a great place to spend a summer’s day splashing about in the various pools. 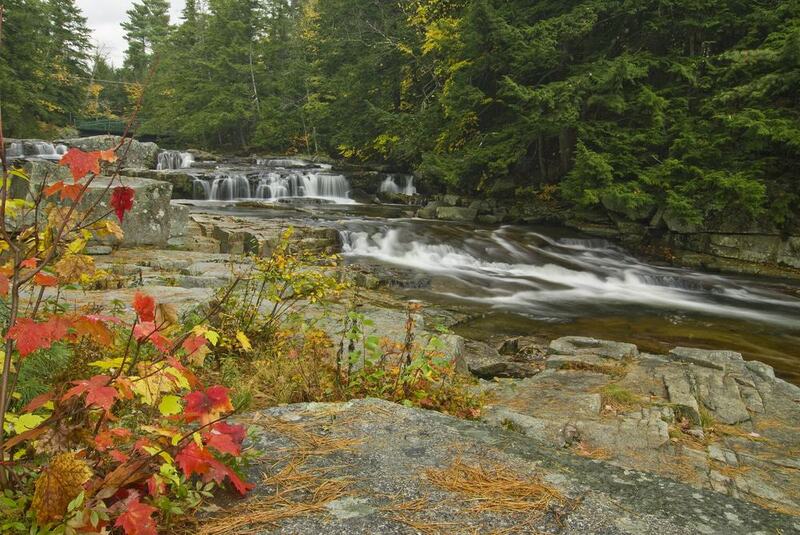 A 0.7-mile walk unveils the beauty of Avalanche Falls. The first half of the trail that leads to it may be strenuous, but the remaining 1.4 miles is less challenging. Avalanche Falls are 45 feet high and are extremely popular with tourists. If you’re looking for some peace and quiet to enjoy the natural beauty here, try trekking a little further to the top of the waterfall. 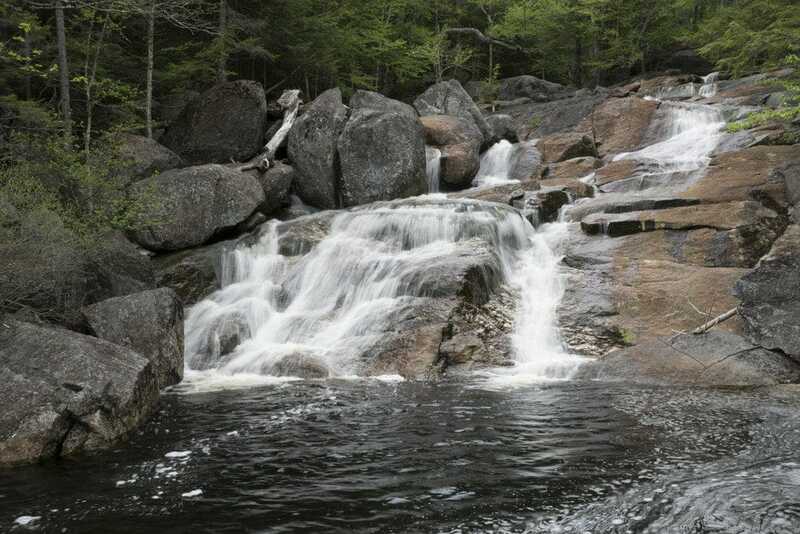 Lying on The Flume trail, you’ll see a number of other waterfalls, sweet covered bridges and the famous “Pool” – a 40-foot-deep, 150-foot-wide basin in the middle of the Pemigewasset River. Dogs are not allowed in this state park, and you are required to pay a fee to visit the area. Accessed by an unmarked trail, this scenic spot in the Second Presidential State Forest is relatively unknown. The cascade can be reached via a 1.3-mile hike from the underpass below Route 93. You’ll reach the lower falls first – a 30-foot drop across a 20-foot-wide ledge with an attractive pool at the base. Here, you’ll find plenty of picturesque spots for a picnic. If you continue on, you’ll reach the Upper Falls – also known as Harvard Falls. These are a powerful 60-foot plunge which is well worth the extra walk to check out. 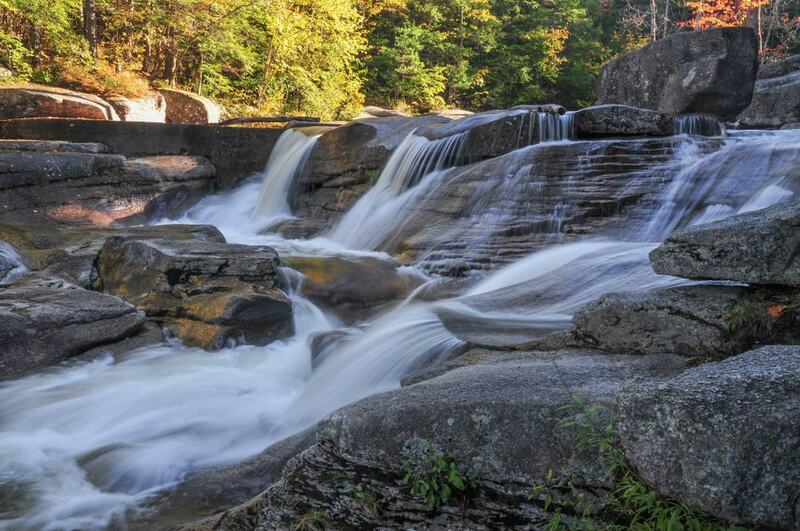 Meet Pittsburg’s hidden gem – the Garfield Falls. This is a remote 40-foot fall, mostly on private property, but with public access granted. Garfield Falls have a 35-foot drop into a very pretty gorge and are reached with an easy 10 minute (0.25 mile) walk. Swimming is allowed here, so bring a picnic, towels, and refreshments and enjoy a whole day in this beautiful spot. Offering a 40-foot total drop, Profile Falls is a wide waterfall that sits on the Smith River. The trail that leads to it is only two miles long and accessible, but it also happens to be narrow, rocky, and semi-difficult. The pool beneath the falls is very large and excellent for swimming, but over the weekends it can be a little overcrowded. When you first see the fall, its size is something that will leave you astounded. It may not be too tall, but the volume of its water is enormous. Presenting a sandy shallow pool and lower falls area, Beede makes for a great family picnic on a sunny day. At 37 feet high, these falls form an amazing cascade in the pool, which measures about an acre. The 0.2 mile each way hike is super easy, and will only take you about 10 minutes. Set in the Profile Falls Recreation Area, there are plenty of picnic tables, trails, and even grills to make use of. Swimming and fishing is permitted here – although be sure you have the appropriate license if you do want to give fishing a go.